Hummingbirds get their energy from flower nectar and the sugar water they find at feeders (recipe below). For protein and real nourishment, however, they eat insects and spiders. You might try putting out overripe fruit. Banana peels are good to attract flies for your hummingbirds. Use one part ordinary white cane sugar to four parts water. Boil the water for several minutes. Stir in the sugar while the water's still hot. Let cool before filling the feeder. Store unused syrup in the refrigerator for up to two weeks. This mixture approximates the average sucrose content (about 21%) of the flowers favored by North American hummingbirds. Put up your hummingbird feeders in June and take them down again in September. 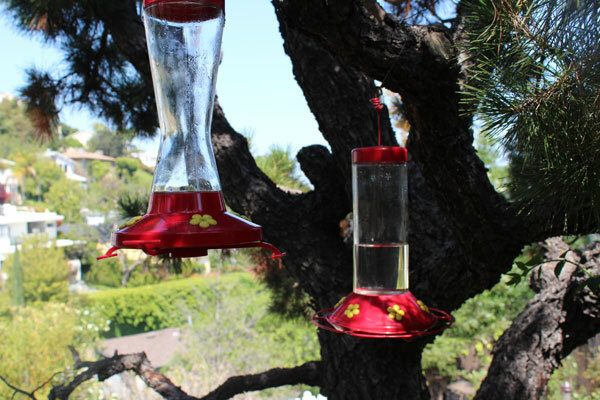 It is the hot summer months of July and August and even September on the west coast, that your hummingbirds will really appreciate your feeders. 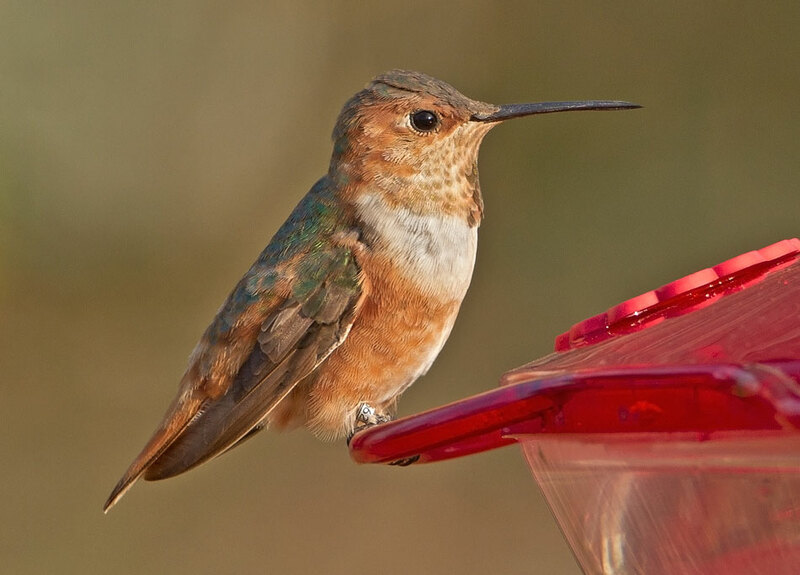 However, if you want to attract an out of range vagrant hummingbird, you can keep your feeders up through November. This is important. 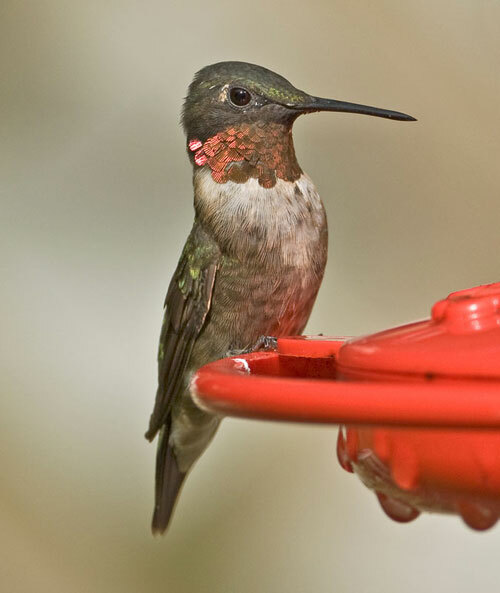 If you don't keep your feeder clean, your hummingbirds will not visit them. 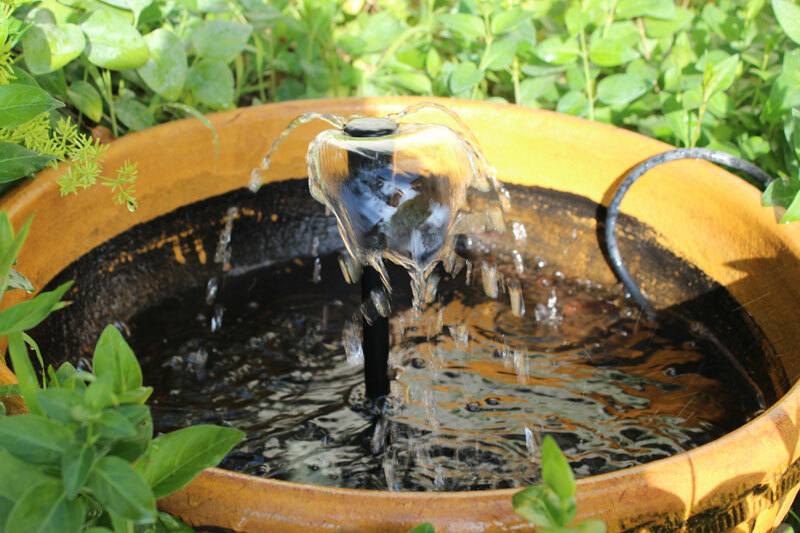 Every filling, flush the feeder with hot tap water (not distilled); a bottle brush can be very helpful. Do not use soap. 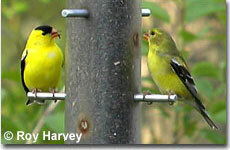 If the sugar solution in your feeder turns cloudy, it's spoiled and needs to be replaced. When the temperature is over 80 degrees (F), clean and refill every three or four days. Over 90°F, it might spoil in two days. 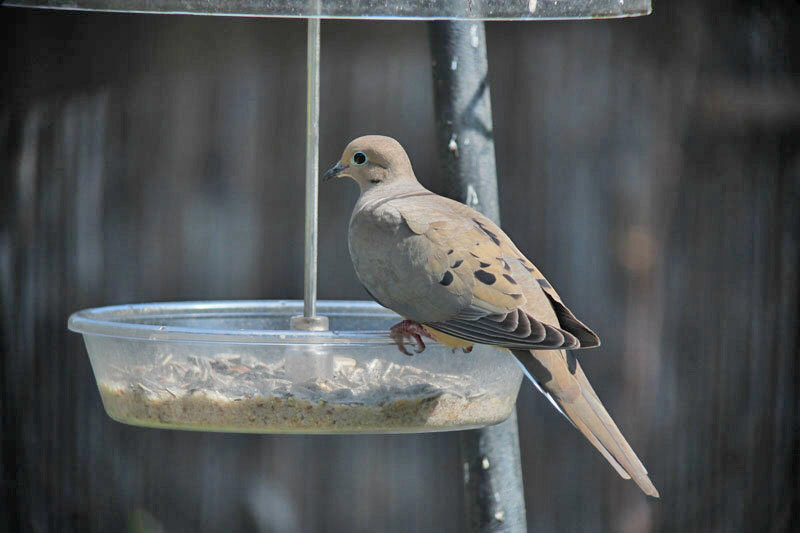 At least once a month, clean the feeder thoroughly with a solution of 1/4 cup bleach to one gallon of water. Soak the feeder in this solution for one hour, then clean with a bottle brush. Rinse well with running water and refill. Any remaining traces of bleach will be neutralized by reacting with the fresh syrup, and there's no need to air dry before refilling. Bleach is both safe and very effective. 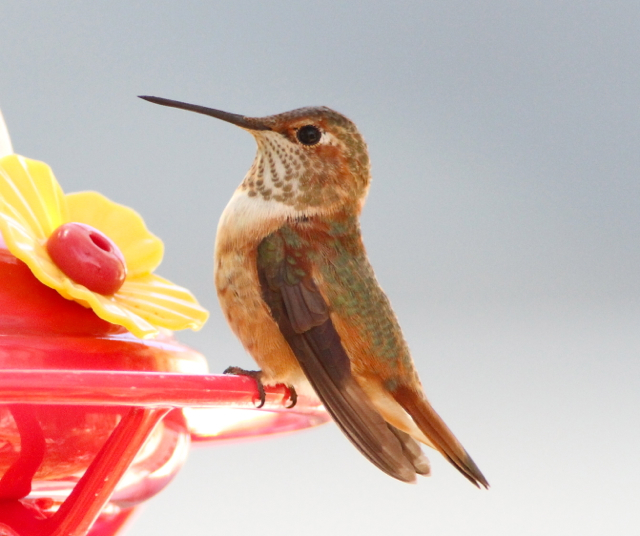 Hummingbirds will not delay migration if a feeder is present. 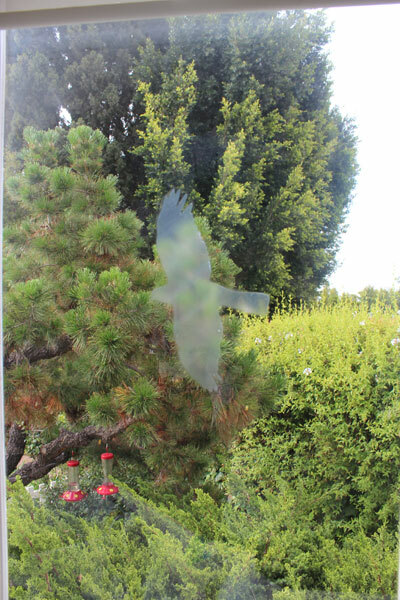 However, if you do have a late season hummingbird, please click here for an article. 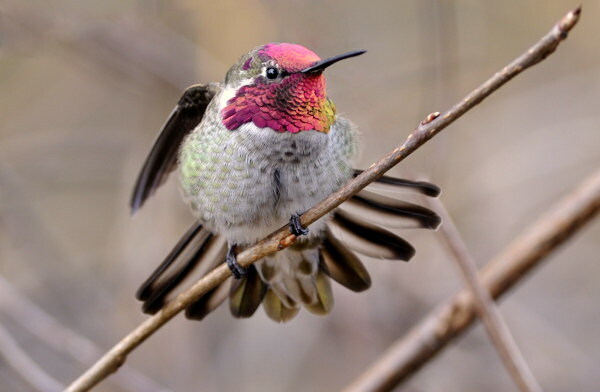 The Pacific coast of the U.S. (and extreme southwestern Canada) has a population of non-migratory Anna's Hummingbirds; if a feeder is maintained over the winter, hummers will visit it year-round. 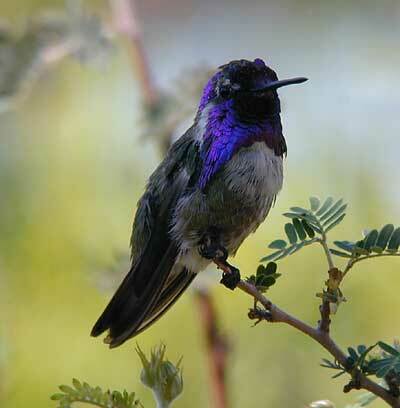 Some other locations near the Mexican border in SE AZ also have winter populations of several hummingbird species. Buy a dripless feeder. Some feeder models feature a built-in ant moat that may be filled with water; don't use oil, since small birds like to drink from ant moats. If wasps persist, first try moving the feeder, even just a few feet; insects are not very smart, and will assume the food source is gone forever. They may never find it in its new location, while the hummers will barely notice that it was moved. If that doesn't work, take the feeder down for a day, or until you stop seeing wasps looking for it. You'll see hummers looking for it, too, but they won't give up nearly as soon as the wasps. Also, reducing the sugar concentration to 1 part sugar in 5 parts water will make it less attractive to insects, but probably won't make the hummingbirds lose interest. Birders hoping to attract any of these late season hummingbirds should get their feeders up in Oct, and not take them down until mid-December. 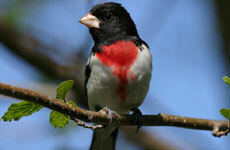 * Put your feeder up near some areas of good cover (like cedar trees, boxwoods, etc.) if available. In cold weather hummingbirds will need these areas for roosting. * If cold weather (below freezing) is forecasted, you should take your feeder inside at night and put it back out in the early morning. Others have rigged up small heaters for their feeders. * If you have any late season flowers etc. those will help to attract late hummingbirds also. Several websites discuss hummingbird plantings and some also recommend which plants are hardy enough to last in cold weather. * Folks in Louisiana hang lots of red Christmas ribbon, red surveyor's tape, and other red items around their yards to be sure hummingbirds won't pass them by. Some believe the hummingbirds fly down pathways (like roads) and have trails of red leading from the road into their house. In particular, Rufous Hummingbirds, which arrive on their breeding grounds in Alaska at times before the ice breaks, are particularly well adapted to cold weather. 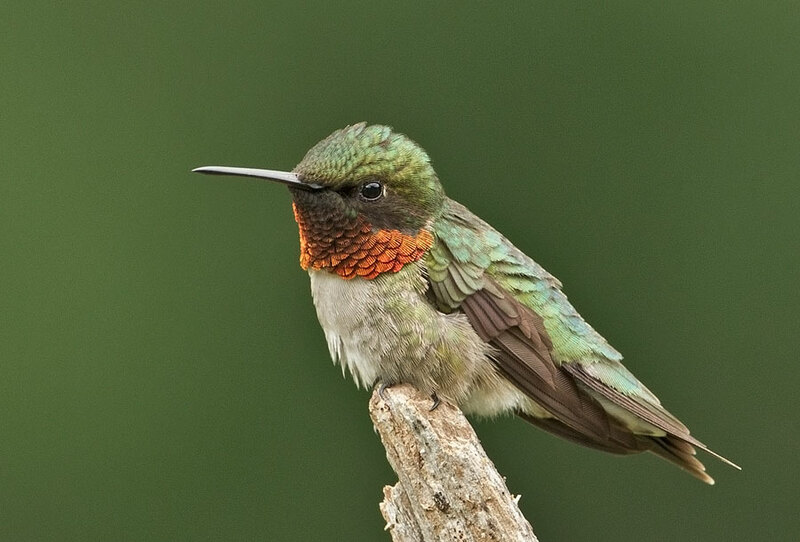 Ruby-throated Hummingbirds in Maryland typically depart by early October. The Yellow Book (Field List of the Birds of Maryland by Iliff, Ringler, and Stasz 1996) shows a dashed line into early November, and late dates in mid November and 3 Dec. 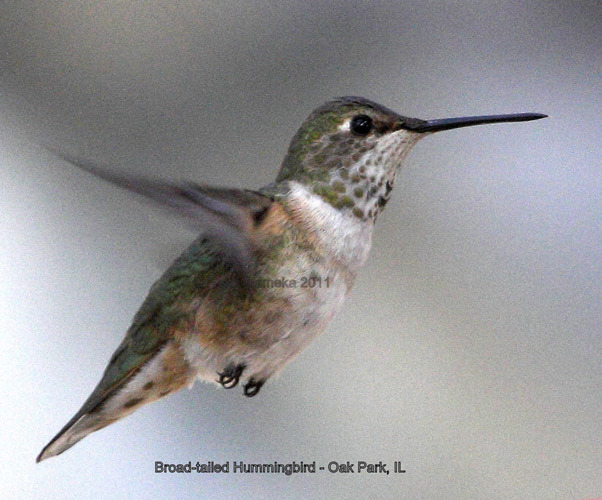 However, several of these hummingbirds were not conclusively identified as Ruby-throated. Massachusetts has a record of Black-chinned from 25 Nov-11 Dec, another Black-chinned was in Cape May 10-15 Nov 1996, and yet another was in Halifax, Nova Scotia, 15-23 Nov 1988. Of the rarer species, Allen's has appeared in late August and November. Anna's have been found from mid-October to late November. Broad-tailed in November-December. The Broad-billed Hummingbird in NS appeared in late September while the SC one was in July. Both Green Violet-Ears have been in late October. Selasphorus hummingbirds are easily recognized by the bright orangeish or cinnamon wash on the flanks, which is also shared by the smaller Calliope Hummingbird. A flash of Rufous in the tail is also diagnostic for Selasphorus/Calliope hummingbirds. Call notes are quick different from the full sounding that we hear at our feeders all summer from Ruby-throateds. Adult males of all species are distinctive and well covered in field guides (although adult male Allen's are not separable from variant Rufous). Female and immature Selasphorus are so difficult to identify that close-up video and or photography, or in-hand measurements, would be necessary to confirm species identification. Ruby-throated Hummingbirds are even harder to separate from female Black-chinned, and in-hand measurements are the best way to confirm species identification. 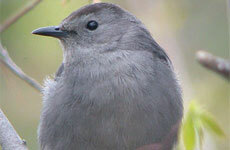 Female Black-chinneds do differ from Ruby-throateds in bill length and details of the primary feather shape, which could potentially be assessed from close-up video or photography. Van Remsen (in Lousiana) believes that any Ruby-throated/Black-chinned that wags its tail WHILE FEEDING is sure to be a Black-chinned. Ruby-throateds flick and wag their tail while hovering near the feeder, but when their bill is in the feeder, their tail little more than quivers. As far as I have seen in the past year, that has held true. Violet-Ears and Blue-throateds are VASTLY larger than Ruby-throated, as is Magnificent Hummingbird, another potential vagrant that has yet to be recorded. 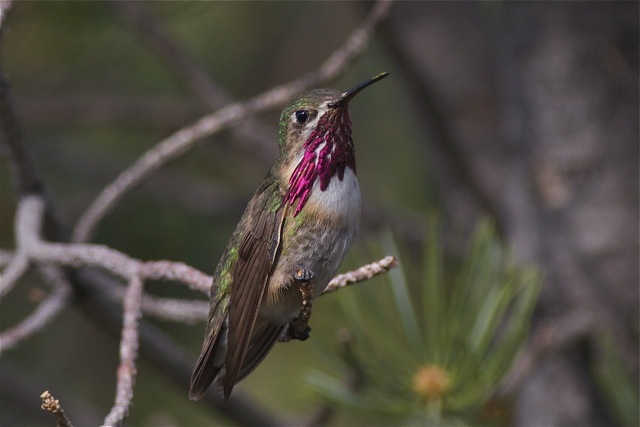 Birders hosting rare western hummingbirds should consider having their hummingbird banded for species identification and to contribute to our body of knowledge on their movements. A fair number of hummingbirds ARE recovered. Note that one in Vienna, VA, last year disappeared late in the season and moved 15 mi southwest. We know this only because of the banding efforts. Others in Lousiana and the Gulf Coast are known to return to the same feeder year after year and the amount of fascinating information the banders down there generate is incredible. The danger to the bird is minute and the information to be gained is excellent. If you host a late-season hummingbird and do not wish to have it banded, it would be good to at least allow some photographers to view the bird to try to confirm the species. Those interested in the details of species identification should consult Peter Pyle's 1997 Identification Guide to North American Birds - Part I, a banders manual that covers the details of hummingbird identification and steers birders towards more detailed articles in the reference section. We still have a lot to learn about how and why these hummingbirds are getting here, where they go from here, and what their survivorship is. 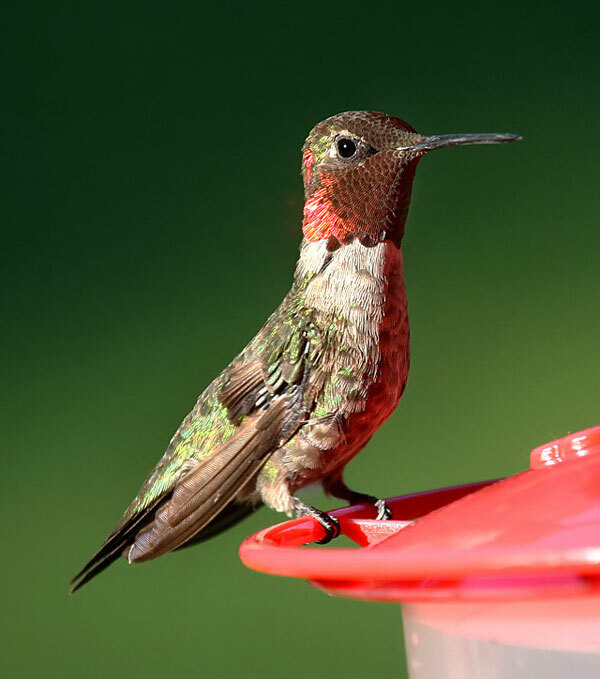 Some might fear that leaving their feeders up might induce hummingbirds to stay later than they should, but this isn't really the case. For starters, almost all Ruby-throateds are gone by now anyway. 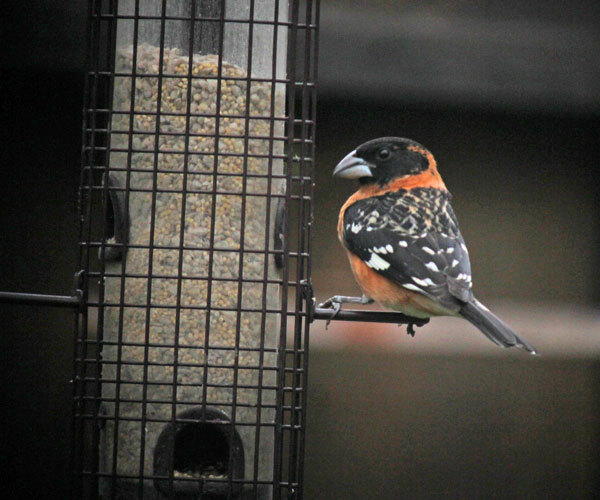 Second, if a Rufous successfully winters at a feeder, it has saved a long and perilous migration where there is no certainty of finding another good food source. Third, these birds arrived here of their own power and/or volition. They will leave for better climes if they feel it is necessary. 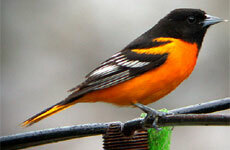 Winter are hard on birds, even "winter birds", but remember that so is migration. 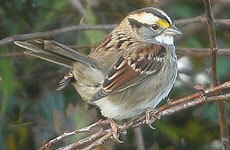 It is a trade-off for birds whether to risk a cold winter in order to outweigh the dangers of a long migration. A popular but (in my opinion) misguided practice recently is taking these hummingbirds into captivity and shipping them off to California or somewhere. Among other things, the individual almost certainly did not come from CA, TX, or wherever else it was sent. Second, we don't know enough about bird navigational systems to know if we would even be doing this bird a favor. 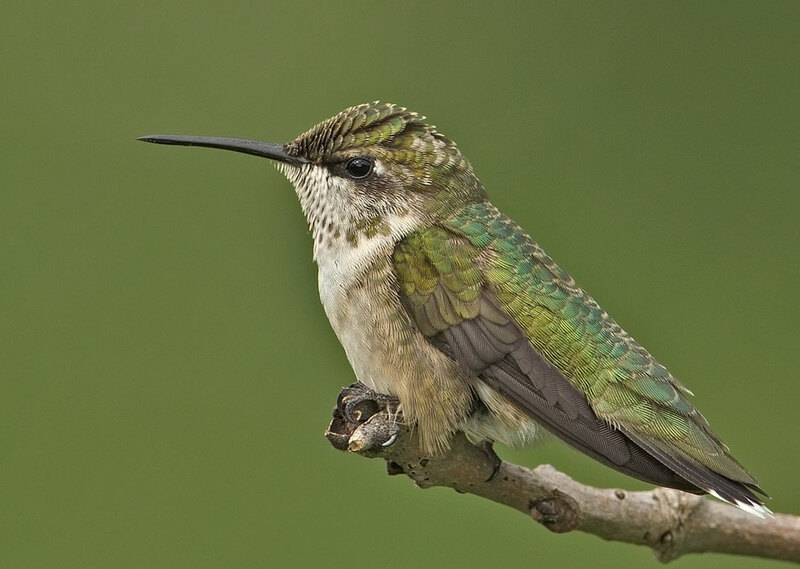 If the hummingbird had correctly navigated to the East Coast from breeding areas in the Pacific Northwest, it would plan on returning Northwest. Would a Rufous Hummingbird air-shipped to CA still fly Northwest in migration? If so, we have delivered a death sentence more grave than any Northeast winter (which hummingbirds have survived). Put out those feeders if you wish and you may well be rewarded with a rare western visitor! Let us know if you are so lucky!! !